1. We at Food Sovereignty Ghana (FSG) a grass-roots movement of Ghanaians, home and abroad, dedicated to the promotion of food sovereignty in Ghana, crave the indulgence of of honourable members of the Appointments Committee of the Parliament of the Republic of Ghana, to register our strongest opposition to the nomination of Hon. Dr. Owusu Afriyie Akoto as Minister-Designate for Food and Agriculture. 3. Of course he neglects to mention that Americans are trying to pull away from GMOs. Evidence begins to emerge that a multitude of health problems, including cancer clusters in the US, may be linked to GMOs and their toxic chemicals. 4. The basic premise which informs FSG’s principled position which it has maintained since its inception in 2013 is the fact that there is still no consensus amongst the scientific community on the safety GMOs. Does Dr. Afriyie Akoto think the only danger to our health is posed from something that kills you immediately when you touch or taste it? Evidence of the serious dangers of GMOs have been emerging with increasing frequency and urgency. Dr. Afriyie Akoto appears to have missed them completely. 5. 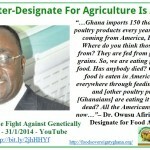 Dr. Afriyie Akoto is ignoring the fact that most of the world is recoiling from GMOs, including the country of their origin, the United States. The long term damage to human health, the death of the soil, the reduced productivity, the contamination of water and air, the evolution of super pests and the powerful chemical cocktails that are part of all commercial GMOs have caused people to turn away from GMOs. 6. Countries using GMOs have also seen the extinction of many varieties of seed and the dwindling diversity of available seeds just when we need added diversity and flexibility to protect us from climate change. What message is the President trying to send to Ghanaians by this nomination? 7. The scientists who refer to GMOs as safe are almost entirely those subsidized or co-opted by the corporate chemical seed giants who finance whole university departments and scientific publications. GMO corporate shills staff the upper levels of the US Department of Agriculture as well as the Food and Drugs Administration (FDA). Where there is true and independent research into GMOs it is raising more and more alarms. 8. Dr. Afriyie Akoto seems to have fallen hard for the corporate lobby representing GMOs. They nod and smile and say they represent “Science”. They represent their version of ‘science’ as if it werefixed and immutable doctrine, the opposite of science. They spread lies and money liberally. Who can tell if they are working very hard to recruit all Ghana’s political parties, our academics, and the media to fall for their long con? Dr. Afriyie Akoto appears a willing and eager victim. That makes him wildly unsuited to be Ghana’s Minister of Agriculture. 9. A wide coalition of stakeholders has already expressed concern about the introduction of GMO into our food system. These include the Christian Council of Ghana, The Catholic Bishops Conference, The Ghana Muslim Mission, The Office of The Chief Imam, The Peasant Farmers Association, the Vegetarian Association of Ghana, the General Agricultural Workers Union (GAWU) of the Trade Union Congress, The Convention People’s Party and the Rastafari Council and Food Span among others. Surely this constitutes a significant collection of key stakeholders in this nation who will disagree with Ghana continuing down the path we seem to be heading regarding adopting GMOs in our agriculture. It is hoped that President Akufo-Addo will give a listening ear to the concerns of the Ghanaians who voted overwhelmingly for change. Ghana deserves better. Thank you for your kind attention. Accra, Thursday, 19th January, 2017.